Chart No. 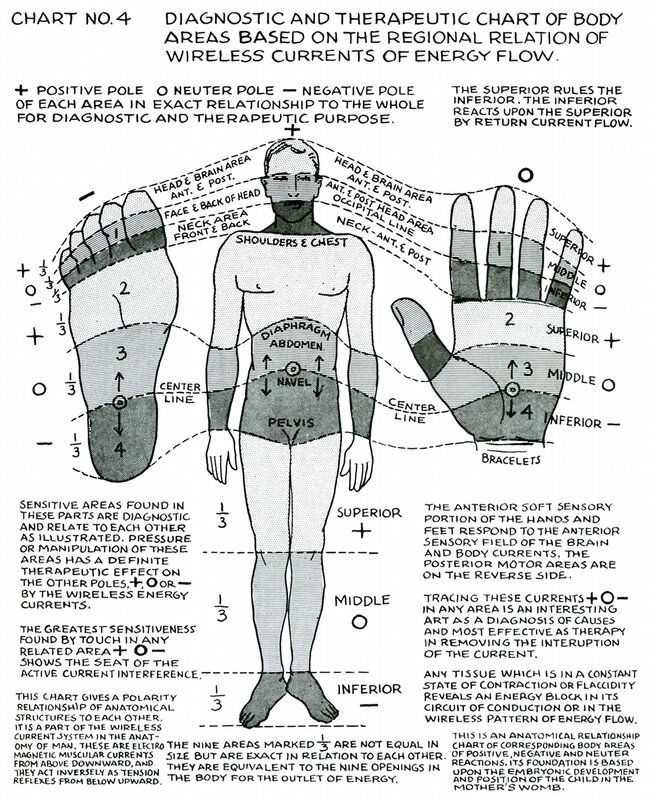 4 - Diagnostic and Therapeutic Chart of Body Areas Based on the Regional Relation of Wireless Currents of Energy Flow. of each area in exact relationship to the whole for diagnostic and therapeutic purpose. The superior rules the inferior. The inferior reacts upon the superior by return current flow. Sensitive areas found in these parts are diagnostic and relate to each other as illustrated. Pressure or manipulation of these areas has a definite therapeutic effect on the other poles, +, 0 or - by the wireless energy currents. The greatest sensitiveness found by touch in any related area + 0 - shows the seat of the active current interference. 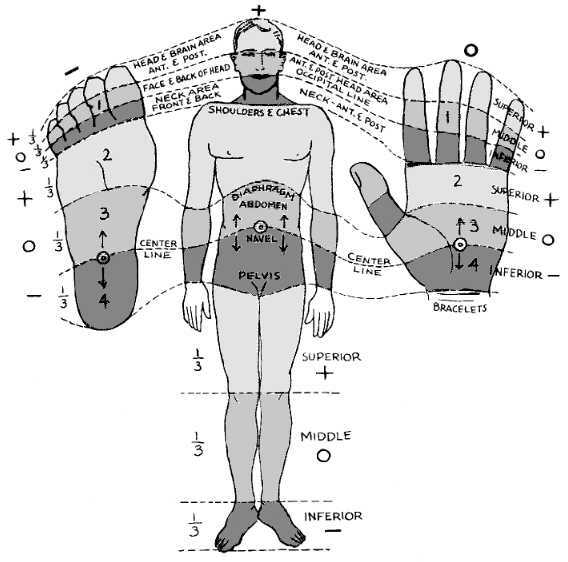 The anterior soft sensory portion of the hands [palmar] and feet [plantar] respond to the anterior sensory field of the brain and body currents. The posterior motor areas are on the reverse side. Tracing these currents + 0 - in any area is an interesting art as a diagnosis of causes and most effective as therapy in removing the interuption [interruption] of the current. Any tissue which is in a constant state of contraction or flaccidity reveals an energy block in its circuit of conduction or in the wireless pattern of energy flow. This chart gives a polarity relationship of anatomical structures to each other. It is a part of the wireless current system in the anatomy of man. These are electro magnetic [electromagnetic] muscular currents from above downward, and they act inversely as tension reflexes from below upward. The nine areas marked &frac13; [one third] are not equal in size but are exact in relation to each other. They are equivalent to the nine openings in the body for the outlet of energy. 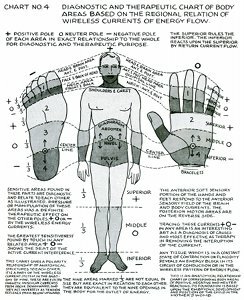 This is an anatomical relationship chart of corresponding body areas of positive, negative and neuter [neutral] reactions. Its foundation is based upon the embryonic development and position of the child in the mother's womb.